Children and adults that bemoan being poor readers and/or writers seem to have either missed out on or forgotten the golden rule of human learning. While nothing a human does ever makes things perfect, despite what the old saying says, enjoyable practice always leads to improvement. Erin never was and never will be a particularly good basketball player, but if she enjoyed basketball and played every day, she’d certainly get better. 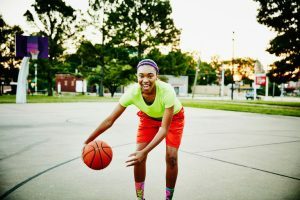 No, she’d never make the WNBA no matter how much she played, but that enjoyable time spent with a basketball would certainly increase her chances of celebrating in a fun, pickup game. Delightful practice is a good thing. No one convincingly can argue otherwise. 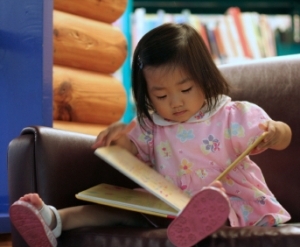 Those who don’t read or write well also can get a boost by engaging in enjoyable practice. They only first need to self-select a book they will enjoy reading, and then relax and read it. When they have finished that book, they can choose another book. Read, Enjoy, Repeat. Over time, following this simple formula will not only make them better readers, but it will grow their strength in other ways as well. What’s the key here? Children must keep selecting and reading fun books. Note the emotional engine that drives this practice. Reading must be enjoyable. Assigned books and other “have-to-reads” typically aren’t fun and, in fact, can lead to young readers who are committed non-readers. Positive emotion is the powerful dynamic that energizes children discovering home-run books, those books that almost all children love and then seek more. Good teachers and childrens’ librarians always have in their tote bags and/or swirling in their minds a collection of sure-fire memorable and delightful reads for children who haven’t yet become joyful readers. If one of those fizzles, they have backup suggestions. 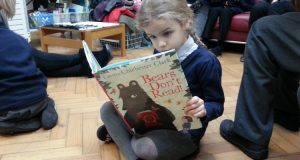 They believe and have experienced that fabulous reading CAN happen for every child…and it must. It’s important that every child become a committed reader or our educational systems cannot claim success. A good education is not about the diploma that teens triumphantly hold in the air. It’s about the understandings, abilities, strategies and habits that they carry off that stage and into life. Graduation rates mean nothing, really. Locked-in habits of lifelong learning and the enduring inclination to inspect, inquire, question and read are what we should strive for and celebrate. Readers internalize the language complexity and powerful words they encounter in good books. Having seen an impressive sentence or a particular word dozens of times as they read, those strong words and sentences carry over into their compositions or their personal and business communications. Indeed, and not surprisingly, the added benefits to being a lifelong reader are good writing, spelling and an overall strong vocabulary. Parents and teachers must keep offering delightful book choices for school kids to make. The subsequent enchanting and powerful expansion of literacy will take care of continued learning throughout the rest of their lives. ← Reading. What’s It to You?